Men and women are very different in their fat storage, as I’m sure you’ve observed. Women store more fat than men – about double the amount. This additional fat is stored in breast tissue so the woman is ready to produce rich, healthy milk when a baby is born – and in the thigh and hip region to provide additional energy for herself and her infant. Again, as you would expect, the fat stored for physiological and survival reasons does not pose a health threat during the woman’s life. The body composition of men and women is different to start with, with men generally (there is overlap) having more lean muscle mass than women. The hormonal and metabolic characteristics of men and women are very different, and have a major influence on the body’s desire to maintain a certain amount of body fat. Higher estrogen levels in the women promote fat deposition. Lean mass, which consists predominantly of muscle, is the most metabolically active tissue in the body. It’s essentially what determines the metabolic rate, the rate of using calories for life and for physical activity. The more muscle mass, the more calories used, even when sedentary. Men, because of their levels of testosterone, generally carry 20-35% more muscle mass than do women of the same height. That gives men a strength advantage, but more importantly, it allows them to maintain a higher level of caloric expenditure at all times. This almost ensures a metabolic advantage vs. women during weight loss programs. With this extra lean mass, men generally consume 500-1000 calories more per day than do women. When they reduce their intake, say 1000 calories, they’re still consuming 2000-2500 calories per day – enough to feel like they’re eating something! When a woman reduces her caloric intake 1000 calories, there’s hardly anything left to eat! That also puts women at greater risk of nutrient deficiency than are men. And studies have shown that nutritional deficiencies, such as with Vitamin C and zinc, can impact the ability of a person to lose weight. It’s as if the body fears further deficiencies will occur, and refuses to let the body lose fat. If women cut their calories to the same amount as men, they are also more likely to suffer from a starvation syndrome. In this case, the body reduces its metabolic rate so that less calories are needed for survival. The thermostat gets turned down, sometimes 25-35%. Men are less likely to develop this syndrome during typical dieting regimens; in contrast, women are very susceptible to experiencing a reduced metabolic rate. The requirement for the woman to bear offspring may play a role during weight loss efforts. The woman’s metabolism is redirected toward use of fat during pregnancy, leaving the easily-digested glucose for the developing conceptus, and maintaining an adequate body fat depot. 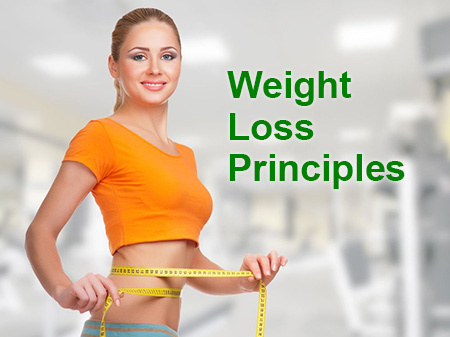 As part of this effect, women experience a resistance to fat loss when they diet. As hard as they try, they always have more difficulty than men do in losing body fat. So if men and women still decide to compete in losing weight, at least use a handicapping method! Men can expect to lose weight at about twice the rate of women. So use that as a guide. For every one pound that the woman loses, the man should lose 2 pounds. Then the bet is at least biologically fair. Men are really not designed to store a great deal of fat. That also makes sense. As the hunter of wild game and as the protector of the family, men must be quick and agile – with nothing impeding their movements (like breasts) or their ability to run down a prey (like extra fat in the legs or hips). And with a very muscular structure, they cannot cool themselves or maintain a constant body temperature if they have too much subcutaneous fat. The one part of a man’s body that needs to be protected with some fat, though, is the abdomen – a vulnerable cavity where vital organs must be protected against injury. All the fat cells store energy as fat (1 pound of fat is equal to 3500 calories). Yet their contribution to health risk or disease is very different depending upon their location in the body. Most fat is stored under the skin in humans. Mother Nature was pretty smart in putting it there, because any extra fat was most likely to be available for storage at the end of the summer when the harvest (nuts, berries, roots) was more abundant. And that ‘subcutaneous’ (i.e., under the skin) fat could then also serve a second purpose as insulation against the cold weather that would come soon after the harvest. All of us are born with subcutaneous fat cells that are ready to store fat when there are extra calories available. Being able to store extra fat is a critical protection we need for survival – or at least our ancestors did. And logically, fat that is stored to protect us from starvation and from the cold would not then also pose a health threat to us. Nature is not so contradictory. So what happens when there is an abundance of extra calories – like in modern times? Being efficient animals, humans will store the extra fat in the available fat cells. Women will store most of their extra fat in their thighs, hips and breasts and under their skin – while men will store their extra fat under their skin and in their abdomens. That’s where the problem arises for men. That extra fat becomes ‘risk fat’ for them. The same would be true for women, except they generally don’t store their extra fat there. Abdominal fat can be deposited in the abdominal cavity (inside the abdominal muscles) and on the outside of the muscles as well – right under the skin. The internal abdominal fat is very active fat, so that the fat content of the blood that leads into and out of that region has higher fat content than does other blood circulating in the body. That’s where the risk develops. This high-fat blood flows into the liver, where it has a dramatic effect on the person’s metabolism. Blood lipid levels increase (LDL and total Cholesterol), blood glucose levels increase, triglycerides increase, and the body becomes intolerant or ‘resistant’ to insulin – leading to Type 2 Diabetes. Blood pressure increases due to the insulin effect on the blood vessels, and fatty deposits (atherosclerosis) begin to develop in the arteries of the heart, neck, brain and legs. Do you know that poem about the immense effect that little oversights can cause? It starts ‘For want of a nail, the shoe was lost; for want of a shoe, the horse was lost; for want of a horse, the rider was lost’… and so on until the battle was lost. 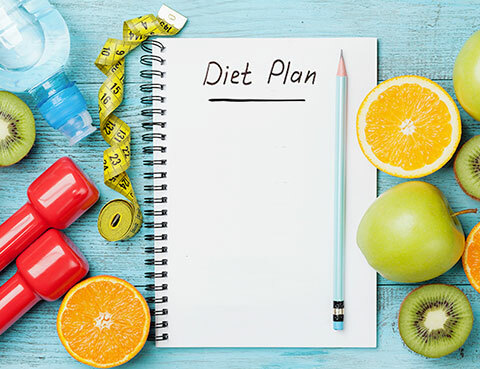 Change the words a bit: ‘For want of a healthy diet, a lean abdomen was lost; for want of a lean abdomen, a healthy metabolism was lost; for want of a healthy metabolism, Type 2 Diabetes developed and cholesterol went up… and so on. 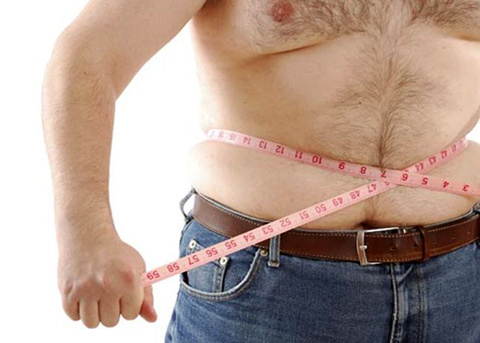 Men are at increased risk in this modern, calorie-rich country because they store their fat in their abdomen. The risk of abdominal fat has been proven over and over again, whether you’re talking about increased risk of High Blood Pressure, Type 2 Diabetes, Gall Bladder Disease, and of course Heart Disease. More evidence about the negative effects of being overweight was just reported from a long-term study at the Mayo Clinic. Overweight heart attack victims were, on average, 3.6 years younger than their normal-weight colleagues who ended up in the clinic’s emergency room. Heart attacks occurred 8 years earlier in obese patients when compared to their normal-weight colleagues. That’s incredible support for a healthy diet, and maintaining (or regaining) a healthy weight. And most of the problem, as I mentioned, is the risk from abdominal fat. A fat abdomen carries many more health consequences than fat knees, fat hips etc.